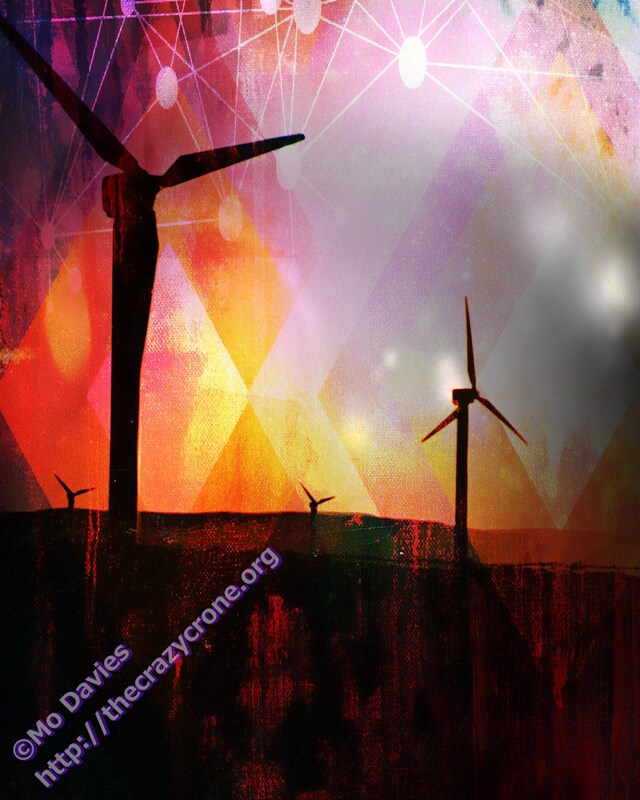 I created this from an original photo I took of a wind farm in Lancashire at dusk in 1994, believe it or not. I’ve always been rather proud of that photo as it was the first one of scenery which looked pretty dramatic and good. The windmills on these farms always remind me of the Martians in War of the Worlds, my original name for this piece of art. But it didn’t seem right so I got a prompt to ask my husband for a title, something I’ve never done before as he’s really not into my digital art. After stuffing around spouting all the criticisms people make of wind farms, I said in exasperation “No, I need a real name”. And out he came with “Dances of the Winds”. Knew he could do it! He’s now very much in my good books! Thanks, Martha, I think this will be one of my favourites. Thanks, Rajiv, I like this one a lot myself. Thanks, Violet – I’ll have to get my husband to put names to more of my digital art!